We are proud to offer a full range of dermatology services for all age groups, including adult and pediatric dermatology, diagnosis and treatment for skin cancer. Click below to learn more about our general dermatology services. Acne is an inflammatory disorder of the hair follicle and its associated sebaceous glands in the skin. Acne most commonly occurs in adolescence but may continue into or even begin in adulthood. The face is most commonly affected, but the scalp, chest, and back may be involved. We offer comprehensive array of treatment for acne, including topical and oral medications, including isotretinoin, and chemical peels. Actinic keratosis is a small, rough, raised area found on areas of your skin that have often been exposed to the sun for a long period of time. Most common areas of involvement are scalp, face, ears, lips, back of the hands, forearms, and lower legs. Some actinic keratoses may develop into a type of skin cancer. We treat these lesions to prevent the progression. We offer cryotherapy and topical medications for treatment. Alopecia areata is an autoimmune disease, in which one’s own immune system attacks hair follicles and causes hair to go into resting phase and fall out. It may affect a small spot on the scalp or more extensively involve the scalp and/or body. It is important to distinguish this form of hair loss from other causes for appropriate treatment. Aside from offering comprehensive evaluation for hair loss, we offer localized steroid injections and topical therapy for treatment of alopecia areata. Atopic dermatitis, also commonly known as eczema, is a chronic skin condition characterized by pink dry itchy patches. It may begin in infancy or childhood and continue into adulthood. It may wax or wane over time. It is often associated with asthma and seasonal allergies. We guide patients through acute and chronic management of atopic dermatitis with skin care instructions, topical and oral medications, and in severe cases, phototherapy in the form of narrow band ultraviolet light B.
Nevus is the medical term for a mole. There are moles that are typical, there is the cancer melanoma, and there is the benign type of mole in between the two; the ATYPICAL NEVUS (also called DYSPLASTIC NEVUS). The term ATYPICAL NEVUS describes a BENIGN type of mole that appears atypical or abnormal; either to the naked eye or when looking at the lesion under the microscope. When an atypical nevus appears abnormal, it does not appear to be cancer or it would be called melanoma right away. Features of concern can be described by the ABCDE’s – which are the guidelines to help determine if a mole is normal or abnormal. While the moderately or severely atypical cells in an atypical nevus are benign, they have a somewhat unpredictable future, and might go on to become cancer. However, it is UNTRUE to say that atypical moles are “pre-cancerous.” This has never been proven in a medical study. Only about 40% of melanoma (the cancer) arises in a pre-existing mole. Most melanoma arises on uninvolved skin. It is tempting, even logical, to believe that moderately or severely atypical nevi might go on to become cancer, but the honest answer is – “we don’t know” – and we do not have a way to predict which ones might go on, over time, to behave as cancer. As such, most Dermatologists wish to ensure that atypical moles, particularly those with moderate or severe atypia, are completely removed. This is the philosophy of our Practice as well. People with atypical nevi are at a higher risk for melanoma. While one cannot put an exact number on the increased risks, it appears that the more atypical nevi you have, the higher the risk. The risk is also increased for people with a family history of atypical nevi or melanoma. It is NOT advantageous to remove all of a person’s moles “just in case” they might be atypical under the microscope. The risks of scarring, infection, the uncertain cancerous potential and the possibility of new moles occurring later makes this unproductive, wasteful and even dangerous. The best protection from skin cancer continues to be sun avoidance and protection, such as sunscreen, hats, eye protection and avoidance of the mid-day sun. Everyone should examine their moles for the ABCDE changes monthly. If you go note a changing or atypical mole, please contact the office and we will accommodate you with a prompt appointment. There are different types of lentigos. A common form is a solar lentigo, which appears on the face, upper chest/back, and the back of the hands from chronic sun exposure. They may be treated with cryotherapy, topical medications, or laser treatments. These lesions must be carefully distinguished by a dermatologist from lentigo maligna, which is a slow growing form of melanoma (see Melanoma) that develops from solar lentigo. Contact dermatitis can be divided into allergic contact dermatitis or irritant contact dermatitis. Allergic contact dermatitis occurs when you come in contact with an allergen. Red scaly, sometimes blistery patches will first appear hours to days after the contact. Topical and in some severe cases oral steroid treatment are needed. Irritant contact dermatitis occurs, when you have prolonged contact with irritants, such as water and friction. Those with atopic dermatitis are more susceptible to this condition. Avoidance of irritants and topical treatment are needed to resolve the condition. Skin tags are a common, benign type of growth that appears on the surface of the skin, often hanging by a stalk. They vary in size, growing as large as 5cm. They frequently appear in skin folds of the armpits, neck, belly, and groin. Skin tags are harmless. However, if they resemble other growths, such as seborrheic keratoses, warts, or molluscum contagiosum, your doctor may want to examine them closely to rule out such conditions. Because skin tags pose no danger, they don’t need to be treated unless they become irritated or cosmetically displeasing. In such cases, they can be removed by a procedure such as cryotherapy (freezing), excision, cautery, or ligation. Eczema is a broad term for many types of skin inflammation, also known as dermatitis. The most common form of eczema is atopic dermatitis (sometimes these two terms are used interchangeably). However, there are different forms of eczema, including contact dermatitis. Depending on the cause and severity of folliculitis, it may require no treatment and resolve spontaneously, or it may require treatment with oral or topical antibiotic creams. These conditions may be diagnosed with clinical exam, skin scraping, culturing, or biopsy. They are treated with topical or oral antifungal medications. Granuloma annulare is a raised, bumpy or ring-shaped lesion (patch on the skin), which can occur alone or in groups. Granuloma annulare is benign (non-cancerous). It often goes away on its own. As most people do not have symptoms, treatment is not necessary. If lesions are widespread or cosmetically undesirable, there are several treatment options. It is important to see a dermatologist and get the correct diagnosis and the appropriate therapy. Granuloma annulare is often confused with ringworm, insect bites, or the initial lesion of Lyme disease, which is called erythema migrans. For this reason, it is important for your dermatologist to inspect these lesions to make the correct diagnosis. Sometimes your dermatologist diagnoses granuloma annulare by examining the lesion. A biopsy, a small sample of skin examined under a microscope, may be performed to confirm the diagnosis. To rule out other medical conditions, your dermatologist may recommend blood work. There are many causes and possible contributing factors in hair loss. Comprehensive evaluation that may include blood tests is needed to determine the diagnosis and appropriate treatment. Hives are caused by an allergic reaction in the skin releasing the chemical histamine. Acute hives can usually be treated with medications but chronic hives, lasting longer than 6 months, require an investigation into the cause. Acute hives are usually caused by an allergic reaction or viral infection. Acute hives go away after a few days or week, but may return again after exposure to the allergic trigger. Common triggers of hives include foods (peanuts, chocolate, fish, tomatoes, eggs, milk), insect stings and medications (penicillin, sulfa drugs). The cause of acute hives can often be identified. When the cause of hives is known, the most important step is to eliminate the trigger. When the cause is unknown, medications such as antihistamines can provide relieve from the symptoms. Keloids are a type of scar that usually grows beyond the original border of skin injury. It often causes itching, pain, and discomfort. Localized steroid injection into the keloid scar is often effective in shrinking the scar and relieving the symptoms. Melanoma is the deadliest form of skin cancer and can be found in people of all skin colors. It often arises on sun-exposed areas but can be anywhere on the skin and very rarely in other organs as well. It can develop from an existing mole or appear on previously normal skin. Early detection through careful skin cancer screening is paramount to timely intervention that can be life-saving. Moles are common small brown spots or growths on the skin that appear in the first few decades of life in almost everyone. They can be either flat or elevated and are generally round and regularly shaped. Many are caused by sun exposure. The cells of some moles can change into skin cancer, especially melanoma. It is important to learn how to do a skin self-examination to look for concerning changes in moles. Ultimately, a dermatologist is the only person who can differentiate between a normal and abnormal mole, but there are some ways to tell at home whether a mole may be abnormal. If you suspect that a mole may be abnormal, report it to your doctor as soon as possible. Psoriasis is a chronic inflammatory skin disease that is classically characterized by thickened, red areas of skin covered with silvery scales. It may cause itching or burning. In the U. S., two out of every hundred people have this condition. Some people will only have discrete, localized areas on the elbows, knees, scalp, or hands, and others may have generalized body involvement. The joints and nails may also be affected with the disease. Psoriasis is not contagious, but it may be found in multiple members of the same family. Psoriasis cannot be cured, but it can be controlled with treatment. Appropriate treatment can be determined based on a patient’s health, age, lifestyle, and the severity of the disease. Rosacea is a chronic skin disease that causes redness and swelling, mainly on the face. Those with rosacea may initially develop a tendency to flush or blush easily. It can eventually progress to persistent redness with pimples and visible blood vessels in the cheeks, forehead, chin and nose. Early diagnosis and treatment can control rosacea so that it is usually not visible or uncomfortable. Early treatment also may stop rosacea from progressing. Aside from appropriate skin care, treatment options include topical and oral medications and laser treatment. This is a common, inflammatory skin condition that causes redness with flaky scales on oily areas such as the scalp, face, and/or certain parts of the trunk. People with dandruff may be considered to have the mildest form of seborrheic dermatitis, but they lack the redness or inflammation that is characteristic in seborrheic dermatitis. There is no cure for this condition, but it can be controlled using non-prescription shampoos containing zinc pyrithione, ketoconazole, selenium sulfide, or salicylic acid. In recalcitrant cases, prescription strength topical medications may be used. These are benign wart-like growths that usually begin as small bumps but can gradually enlarge and thicken. It generally occurs in people who are middle aged and older. Commonly, people have multiple of these, but they are not contagious. The cause of these growths is unknown. Because they are benign growths, they generally do not need treatment. However, if they turn black, bleed, itch, or become painful, they need evaluation in order to be distinguished from skin cancer. Shingles is a painful, blistering rash that is caused by the same virus that causes chickenpox, the varicella-zoster virus (VZV). Shingles can ONLY occur in people who have had chickenpox. Although the symptoms of chickenpox usually go away after the recovery from the initial childhood infection, the virus remains hidden in nerve cells. In some people it remains dormant forever, yet in others it attacks again. The second episode of chickenpox virus infection is called SHINGLES. Shingles attacks can be made less severe and shorter by using prescription antiviral drugs. These medications should be started as soon as possible after the rash appears. Other treatments to consider should be discussed during your visit. More than one million skin cancers are found in the U. S., and the rate has been increasing. The leading cause of skin cancer is sun exposure, and people who have fair skin or burn easily in the sun are most susceptible. However, skin cancer can be found in people of all types of skin color. Three most common types of skin cancer are Basal Cell Carcinoma, Squamous Cell Carcinoma, and Melanoma. Basal Cell Carcinoma is the most common type of skin cancer and can appear in different forms: shiny smooth bump, non-healing sore, waxy scar, or pink scaly patch. Although Basal Cell Carcinoma very rarely spreads to other parts of the body, early detection and treatment are important to prevent extensive destruction of the tissue in the area. Squamous Cell Carcinoma is the second most common type of skin cancer. It generally appears as red, scaly or crusty growths on sun exposed areas. Squamous Cell Carcinoma can grow deep into the tissue and if neglected, can metastasize and become life-threatening. Skin tags are very common, soft, skin-colored or tan or brown growths. Generally no treatment is required as they are harmless. In case the skin tags become problematic, we do offer treatment options. Squamous Cell Carcinoma is the second most common type of skin cancer. With early detection and proper treatment, SCC is curable. Left untreated, aggressive SCCs have a greater risk for spreading to lymph nodes and other internal organs. Tinea versicolor is a fungal infection of the skin. The fungus interferes with the normal pigmentation of the skin, resulting in small, discolored patches. These patches may be lighter or darker in color than the surrounding skin and most commonly affect the trunk and shoulders. Antifungal creams, lotions, shampoos or in more severe cases prescription-strength medication can help treat tinea versicolor. Warts are viral infections caused by Human Papilloma Virus. They often grow on the hands, feet, elbows, and knees, but can be found anywhere on the body. They can cause pain and bleeding in some cases. There are a variety of treatment modalities, including debridement, cryotherapy, application of topical medications, intralesional injection, and laser therapy. It is important for people with signs of a skin disease to see a dermatologist to get the correct diagnosis and treatment. It is important for anyone with signs of a skin disease to see a dermatologist to get the correct diagnosis and treatment. We strive to create a non-threatening environment where your child will feel comfortable. When several treatment options are available we make every effort to choose the least intimidating option. Many parents are surprised to learn that most common conditions such as warts and molluscum can be treated painlessly. Our friendly staff will always go the extra mile to make your child’s visit a pleasant experience. 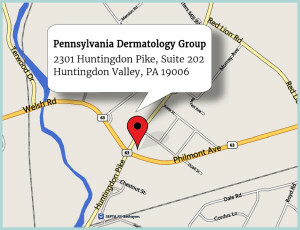 At Pennsylvania Dermatology Group we treat a large number of skin cancers. For most skin cancers, the treatment is surgical. We offer state of the art care including Mohs surgery when indicated. In many cases a diagnosis can be made based on clinical appearance by our skilled physicians. In some instances, a biopsy may be needed. Once the diagnosis has been confirmed, your doctor will discuss treatment options and make recommendations. These recommendations may vary depending on location, size and type of skin cancer, as well as your medical history. Basal Cell Carcinoma (BCC) is the most commonly occurring type of skin cancer. Risk factors include history of sun exposure (including childhood exposure) and skin type. People with fair skin are more likely to develop BCC than those with darker skin types. But those with dark skin are not immune! A BCC may have several appearances from a pink bump that resembles a pimple, to a white patch with a scar-like appearance, or a sore that won’t heal. They are most commonly seen on sun exposed skin. Though they may become quite large if left untreated, BCCs are not likely to metastasize, or spread to other parts of the body. Squamous Cell Carcinoma (SCC) is the second most common type of skin cancer. The risk factors are the same as BCC, but also include those with a history of immune suppression, such as a patient with an organ transplant. An SCC may appear as a scaly patch, or a rough bump or nodule that may resemble a wart. SCC may also appear as a sore that will not heal. SCC can be cured if treated early. Though not common, SCC may metastasize if left untreated or if it is a particularly aggressive tumor. Melanoma is the least common type of skin cancer. However, it is also the most dangerous. Melanoma often appears as a new or changing mole. Those with a family history of melanoma are at increased risk for this tumor, as are those with a history of frequent sunburn, excessive UV exposure including tanning beds, fair skin type and those with many or abnormal moles. The ABCDEs provide a guide for evaluating your moles. If you develop an irregular or worrisome mole, this should be evaluated immediately. If detected and treated early, surgery is curative. If left untreated melanoma may metastasize and be fatal. In many cases, our dermatologists can make a clinical diagnosis with confidence without the need for a skin biopsy. Dermatopathology is a subspecialty of dermatology that studies skin disease at a microscopic level. Although many skin diseases can be recognized by their clinical appearance, sometimes a skin biopsy is necessary to secure a diagnosis or to provide more information. This biopsy specimen is then examined under the microscope by a dermatolopathologist who looks at the disease at the cellular level. Dermatopathology is a consultative service to the referring physician and not simply a laboratory test. An accurate microscopic interpretation of the biopsy is important in the selection of appropriate therapies. One of the greatest challenges of dermatopathology is the high number of different skin diseases. There are an estimated 1500 different rashes and skin tumors, including variants. All biopsies and surgical specimens are sent to laboratories where they are examined by a board-certified dermatopathogist, many of whom are board-certified dermatologists as well.